Releasing the Magic! : GREAT SCHOOLS! My personal vision of a GREAT SCHOOL has been shaped over the last fifteen years, in Sheffield, York and Leeds, by visits to so many brilliant learning places where talented colleagues go that extra mile to release the magic. This isn't a headteacher thing but a whole school community thing where everyone has a shared vision that is deeply routed in the belief that all children and young people matter, are cared for 100% of the time and will achieve brilliant outcomes if they have the attitudes, skills and understanding. This doesn't of course mean that all children and young people will be learning the same things, in the same way, and at the same time. Schools must be centres of innovation, creativity and imagination where a commitment to equity, fairness and justice prepares children and young people for life and work in the global and conceptual society of the 21st century. 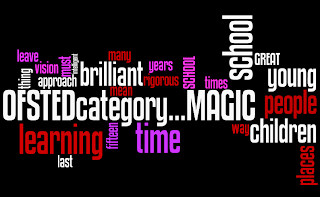 When you walk into a “great” school, as I have done so many times over the last fifteen years, you see the golden threads of excellence that weave their way through everything the school does and raises these brilliant learning places into a special OFSTED category... MAGIC! These wonderful places are responsive to the developmental needs of the children and young people through a rigorous, relevant, rewarding and differentiated curriculum, stimulating and engaging teaching and learning, a collaborative and problem-solving approach to behaviour and discipline, and intelligent accountability systems that drive a rigorous and uncompromising approach to ensuring that every child is a reader, writer and can handle number by the time they are eight, a brilliant little learner by the time they leave primary school and on a pathway to learning success by the time they leave secondary school... whatever it takes! Having led one of the most successful public/private education companies for the last ten years and working in a small, lean and highly successful local authority before that, I know that there is a real opportunity here. If we are prepared to really face the future and put in place services that are fit for purpose and that really make a difference we could strip out a huge amount of the irrelevant, the redundant and the unnecessary which simply detracts from the real business of school improvement. I know it is hard but if we refocus our collective energies and efforts where it matters we can change the outcomes which so often appear stuck and impossible. We need to build co-operative and collaborative communities that work together and learn together and we must coach and support colleagues in this new way of working. I am relatively sure I'll learn lots of new stuff proper here! Good luck for the following!